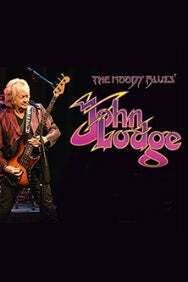 We do not curently have theatre tickets available for John Lodge This could be because we have simply sold out or it could be that this show is no longer running. The information on this page remains purely for historical and informational purposes. John Lodge, legendary bass player, songwriter and vocalist of The Moody Blues and recent inductee into the Rock and Roll Hall of Fame, is bringing his ’10,000 Light Years’ solo tour to Cadogan Hall. This is a unique opportunity to see John perform his Moody Blues’ hits, and some of his solo work, plus a few special treats that are sure to delight both fans and music lovers alike. John will appear with his ’10,000 Light Years Band’, and together they capture the heart of classic Moody Blues songs he has penned and recorded such as “I’m Just a Singer (in a Rock and Roll Band),” “Gemini Dream,” “Ride My Seesaw,” “Isn’t Life Strange,” “Steppin’ in a Slide Zone”, “Peak Hour”, “Evening Time’ (the latter two from Days of Future Passed), and the never before played live, “Candle of Life”.